The 2016 Rose Parade Theme is "Find Your Adventure." The theme of the 2016 Lutheran Hour Ministries Float is "Jesus is the Light of the World." 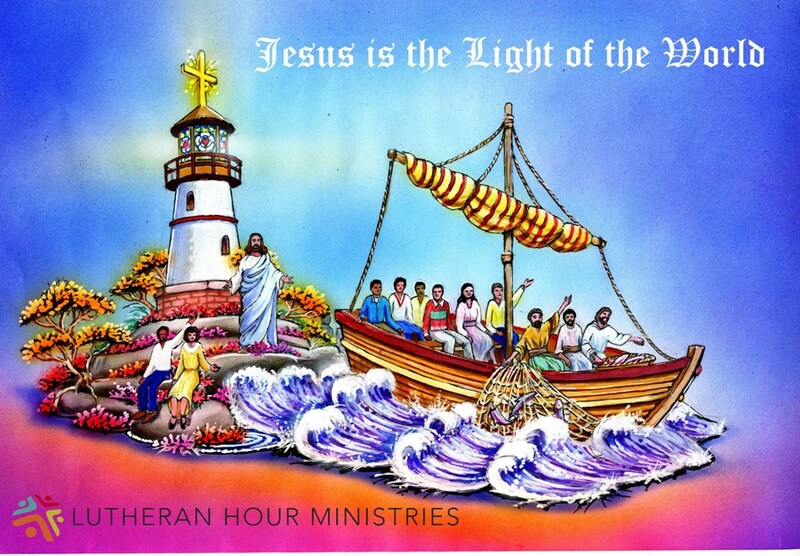 The LHM float features a fishing boat with both biblical and modern era disciples of Jesus Christ sitting beneath a lighthouse crowned with the cross of Christ. The float is inspired by 2 biblical themes. First is the call of Jesus to the first disciples in which He called them from their fishing boats to follow Him into a new way of life. That life would take them away from their fishing nets and start them on a great adventure through which they would carry the message of reconciliation with God the Father through the death and resurrection of Jesus Christ. Our second biblical theme and the inspiration of the title of the float comes from John 8:12 where Jesus says, "I am the Light of the World. Whoever follows me will not walk in darkness, but will have the light of life." As the lighthouse guides boats safely around coastal waters, so too does the light of Jesus guide His followers through their adventures and perils of life. The light of Jesus shines as a beacon of truth into an otherwise dark and fallen world. It reveals the wide expanse of God's love for us. Jesus' call to follow was not only to gather disciples in His time, but is a call to each of us to follow Him in our daily lives. We pray that that all would see the light of Jesus and that we would share in the peace, comfort, and hope that comes from walking in a life of faith in the Living God.